I have just noticed that pencilled lightly on the back of this one is July 1963. Sitting to the left of the brother (as we look at it) with glasses is what I believe to be the same person as featured below under A Champion Swimmer and his Trophys and who we think may be Dr Lim. This is one big effort on your part to treasure heritage. Your site was referred to me by an old Michaelian. Mr Adrian Tsen, our current Old Michaelians’ Association president, SMI former rugger Mr Yip Chee Tong, king scout Master Timothy Chee and another king scout Master Thomas Choo are the people you should talk to as far as the shots are concerned. Their love and attachment to the alma mater is still solidly strong. 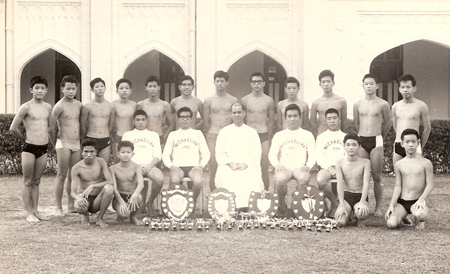 Standing third from left is Jeffery Thong Keon Hin, Form five 1967.the fifth person could be Lim Hui Min (1967). the second person from the right could be Adrian Tsen. the second person on the left could be Ang Chee Huat ? I am referring to all those standing. Brother Vincent sent the below by email via Robert de Silva. “This photo belongs to a period when SMI was creating great waves in swimming. I cannot identify anyone apart from Br Paul.” Warmest regards. Getting ready for the SMI Golden Jubilee in 26th.Sept 2015 and trying to jog my memory banks. Standing from left to right Ng Wai Kim (SEAP games),LimHoMin 6th with glasses,TsenKengYam,Squatting 2nd from left is Choo Gean Swee,and the extreme right is Lee Kee Fong. I think the rest are correct. Thanks Ignatius. Your information is of great help to us. My mistake, Team B – The first two are standing 5th and 6th. I already have an arrangement with Brother Vincent regarding the use of the SMI magazines, suitably credited and I shall definitely contact him again regarding your pdf files. We do have a lot of SMI information on the main site http://www.ipohworld.org and would be delighted if you could peruse some of it and tell us where we have not got it quite right! -The brothers Timothy Chee and Thomas Choo were never King scouts.They never did pass it all. Please call a spade a spade. Paul, I am sorry that you seem to have taken offense at Peter Chiew’s comments. I am sure you will understand that as long as comments don’t break any rules, we allow them to be published. Now you have put the matter straight as far as you see it and I shall leave Peter to comment. In the meantime thank you for visiting ipohworld and your other comments and we hope to hear more from you soon.